This chicken quesadilla recipe is one of my favorites. It’s a great way to use up leftover chicken and one of my favorite easy dinner recipes. Add the oil to a frying pan and heat to medium. Fry the onions until they are soft. Remove them and set aside. 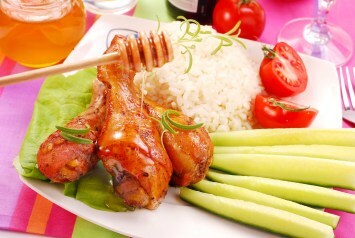 If the chicken needs to be cooked, slice it thinly and fry until cooked through. Lay each tortilla shell flat. Sprinkle 1/3 cup of the cheese over half of each tortilla, making sure the filling is all to one side of the tortilla. Top the cheese with 1/6 of the chicken, onions, peppers, chilies and chopped tomatoes. Fold the tortilla over the filling. Place the tortillas on an ungreased cookie sheet. Bake for 5 minutes or just until the cheese is melted. Serve whole or cut each quesadilla into wedges or strips, beginning the cuts from the center of the folded side. Top with any or all of sour cream, guacamole, salsa, chopped green onions and fresh cilantro. 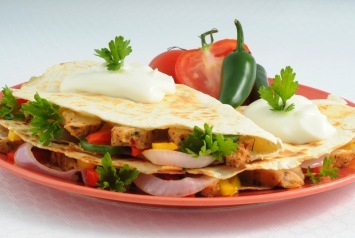 For lighter quesadillas use reduced fat cheese and tortillas. Try low carb tortillas if you are following a low carb diet. Replace the chicken with thin strips of cooked steak to make this a beef quesadilla recipe. Keep it vegetarian by leaving out the chicken. Chilies are optional. You determine the heat by the amount, if any, of chilies you use. You can also add some hot sauce in the quesadilla if you want. Use whatever color of pepper you prefer. I like the taste and color of the red peppers, but green, orange, purple or yellow work well too. If you really like it hot switch it out and use hot peppers. There are so many variations you can make with this quesadilla recipe. You can easily turn it into a steak quesadilla by switching out the cooked chicken for grilled pieces of steak. Vary the cheese you use to change the flavor. Make it vegetarian by leaving out the meat altogether. Up the veggie content by adding fried mushrooms or thin strips of zucchini or leave it classic with cheese and onions. Make it even healthier by putting it all on whole wheat or even corn tortillas. They are both whole grain which is healthier than the white. This is what I love about cooking. Most recipes don’t have to be followed exactly (except baking recipes, unless you really know what you are doing). You can exchange one ingredient you don’t like for something else that you and your family would prefer. This is a good diabetic recipe if you can tolerate the carbs in the tortilla. There are just 22 carbs in the whole quesadilla though so it should work for most diabetics. Give this quesadilla recipe a try one night. You will see how easy it is to cook tasty Mexican food. Here is another quesadilla recipe, a cheesy quesadilla. Find all of our Mexican recipes here.